Born in Sweden and raised in Belgium, Josefine, Caroline and Gustaf Gyllensporre are international students and alumni of FIU – each with a different major – who set out to gain valuable career insight and work experience at the Food Network & Cooking Channel South Beach Wine & Food Festival. 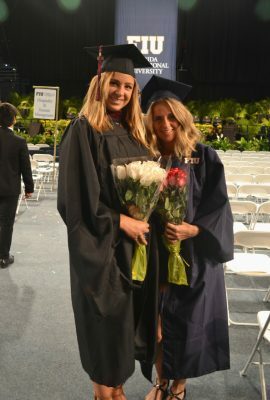 Josefine Gyllensporre, left, crossed the FIU commencement stage with her sister Caroline, right, in 2016. The eldest, advertising alumna Josefine Gyllensporre ’14, MS ’16, convinced her younger sister Caroline to get involved with the Festival as a hospitality management undergrad. Josefine moved to the United States to attend the University of Miami, but transferred to FIU a year later when Caroline was accepted so they could go to school together. Josefine had worked full-time coordinating volunteers for the Festival when she realized her younger sister, who had volunteered the previous year as event support at the north venue (which houses some of the Festival’s signature events, like the Beachside BBQ), would be the perfect fit for an available position as an event coordinator for the Goya Foods’ Grand Tasting Village. Caroline, now a master’s student at FIU studying hospitality real estate development, said having SOBEWFF® experience boosted her resume and attracted potential employers. She now works as a sales executive for Glaizal & Partners at Faena Group in Miami. In her senior year, Caroline’s hard work with SOBEWFF® earned her the Lee Schrager Excellence in Leadership Scholarship, an annual award supported by the Festival given to stand-out students in the Chaplin School of Hospitality & Tourism Management. Through the scholarship, the Festival further helped the young professional’s career by making possible a move to New York City, where she hoped to break into the hospitality industry. Caroline said the Festival is an important opportunity for international students like her and her siblings to earn work experience, which can be difficult when studying in the United States. “You get a feel for what it’s really like to work in the hospitality industry,” Caroline said of the Festival’s fast-paced environment. The Gyllensporre sisters’ experience even convinced their younger brother Gustaf, a current FIU student studying business management and real estate, to give the Festival a try. “[Josefine and Caroline] told me stories about how much fun it was and the experiences they got from it,” Gustaf said, so he volunteered at last year’s Festival setting up tables and handing out samples to guests on the beach. And he returned this year for an internship as a junior volunteer recruiter. Gustaf said the Festival has helped him diversify his skills set and expand his knowledge outside of the field of business. “There are so many parallels [in hospitality] to draw with business, yet it is also different in so many ways. I hope to combine the experiences and knowledge I have gained in both fields for my professional career,” he said. Hosted by Southern Glazer’s Wine & Spirits and FIU, the Food Network & Cooking Channel South Beach Wine & Food Festival benefits FIU’s Chaplin School of Hospitality & Tourism Management. To date, the Festival has raised more than $26 million in support of education and scholarships at the school. The Festival also provides valuable career insight and networking opportunities to more than 1,000 students annually who volunteer in areas like event management, logistics, culinary preparation, marketing and more. Click here for more information on volunteer opportunities at SOBEWFF®. The Festival will take place Feb. 21 – 25, 2018, and will feature internationally renowned talent and leaders of the hospitality industry at uniquely crafted events showcasing world-class wine, spirits, food and fun. Click here for ticket information.